Are you suffering from chronic back pain or sciatica? If so, our massage therapists at Treat Your Feet Buckhead could give you some relief. Neuromuscular Massage Therapy is recognized as an effective treatment for back pain caused by soft tissue injury such as muscle strain, sprain, spasm, or even simple overuse of a particular muscle. Back pain is commonly felt when one or more muscles lack proper blood flow due to muscle spasm and injury. Lack of blood flow will often cause lack of oxygen in the muscle, which in turn promotes production of lactic acid and causes your back to feel sore. Neuromuscular massage therapy uses proven techniques to alleviate pain that stems from damage to muscles, soft tissue, and undue pressure on certain nerves. Neuromuscular massage therapy uses the application of alternating levels of concentrated pressure to reduce pain by realigning and loosening specific muscles, soft tissue and nerves. Our massage therapists are knowledgeable of the proper trigger points, and use neuromuscular massage techniques to relieve issues related to poor posture, nerve compression, and concentrated restriction of blood flow to the muscles. After the muscle is relaxed through massage therapy, undo pressure on nerves is released and the lactic acid is able to let go from the muscle. Only then will the muscle begin to relax and receive sufficient blood and oxygen to provide relief from associated pain, soreness, and discomfort. Pain is commonly caused by overuse and injury to the body’s muscles, soft tissue and nervous system. Neuromuscular therapy massage helps to heal these injuries by applying gentle but firm pressure to the pressure points associated with problematic muscles and nerves. This has been found to be an extremely effective treatment for clients with chronic back pain and is often helpful in reducing short and long term pain associated with strains, sprains and pressure on nerves by muscles and tissues. Treat Your Feet Buckhead offers massage techniques that are used to address a variety of conditions that can stem from poor posture, a physical injury, and additional causes of pain in the back, neck, hips, and shoulders that have not been responsive to other types of treatment. Both neuromuscular massage and deep tissue massage therapies provide pain relief and muscle relaxation, but the difference in massage techniques relates more to where the pain originates than to the similarities of the pain itself. Neuromuscular massage techniques focus on trigger points in order to relieve discomfort in any particular area of the body rather than the actual pain site. Since poor posture is often the cause for the formation of certain trigger points, neuromuscular therapy is more commonly used to address posture related pain issues. If you are not certain as to the origin or cause of your back pain, speak with our therapists before your massage session. 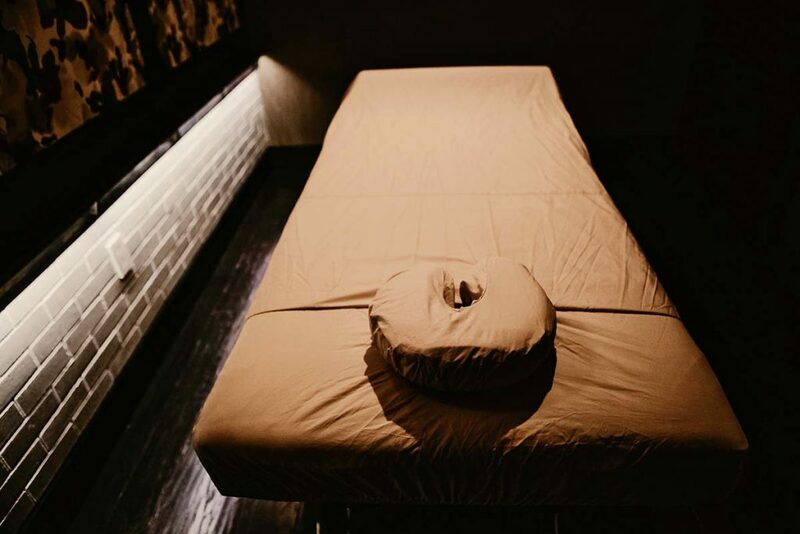 Our therapists at our Atlanta massage spa are trained in different styles of relaxation and therapeutic massage techniques and will be glad to help you decide which massage style will best provide you with a truly pain relieving, relaxing and rejuvenating experience.